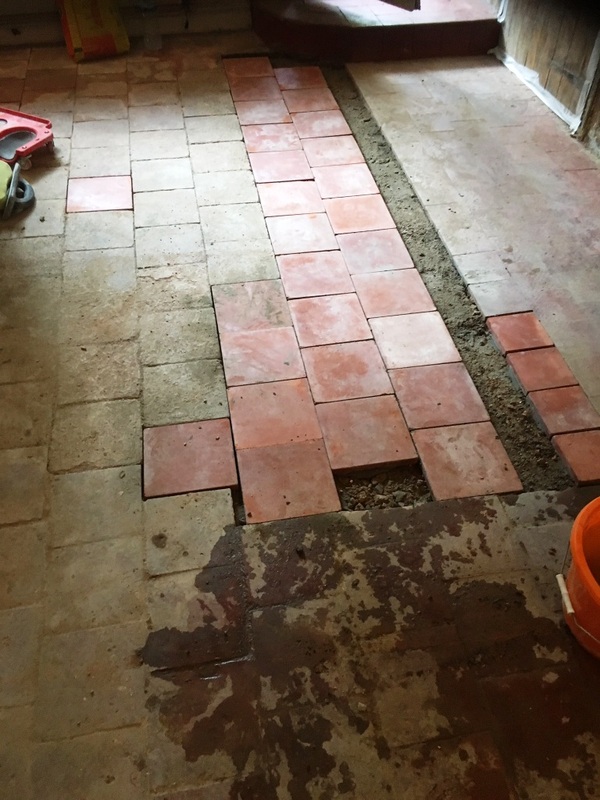 We received an enquiry requesting we take a look extending a Quarry Tiled hallway floor at a property in Blakedown which is a small village in the Wyre Forest District of North Worcestershire. 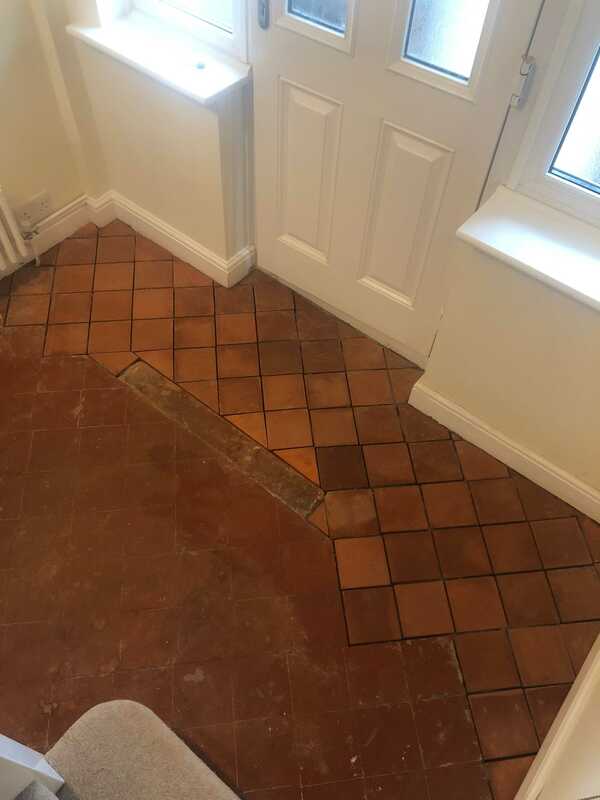 The house had an extension to the front of the property added previously which increased the size of the hallway however this had not been tiled to match the existing, simply backfilled with screed. 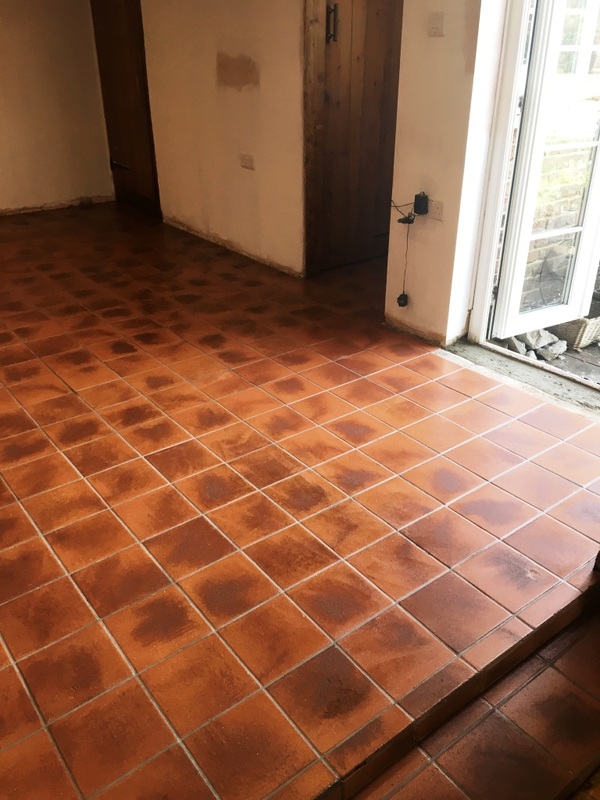 The owner had decided to have the extension floor tiled to match the existing Quarry tiled floor which would also need renovating due to it being covered in part with a variety of paint, glue and screed. Whilst most of our work is repairs and cleaning my background in tiling means I’m also able to lay new tiled floor so this job was a perfect match for my skills. I arranged a site visit to view the floor as it is difficult to tell from the photos the work that would be needed. 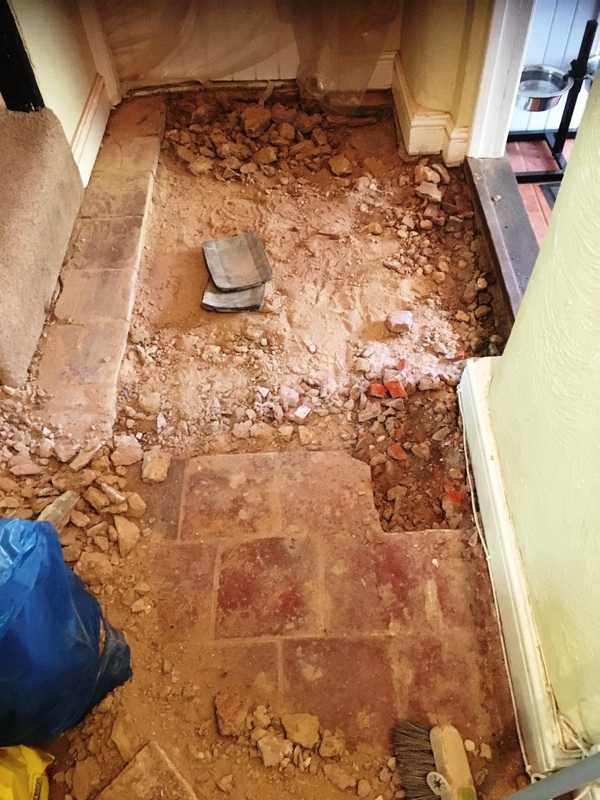 The floor would require extensive restoration and then extending into the extension so after visiting the property and assessing what was required, I wrote out a detailed quote and the quote was accepted. We booked a date in to complete the works which would be carried out over a few days. 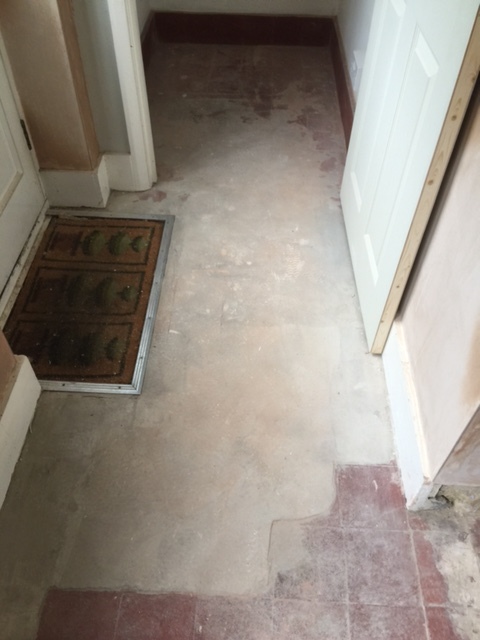 The first job was to break up the existing screed that the builder had laid in the extension. It was a lot of work, so I enlisted the help of Mick Gayton the Warwickshire Tile Doctor. Together we broke up the screed, removed the rubble and then used Bal self-levelling compound to prepare the surface for tiling. 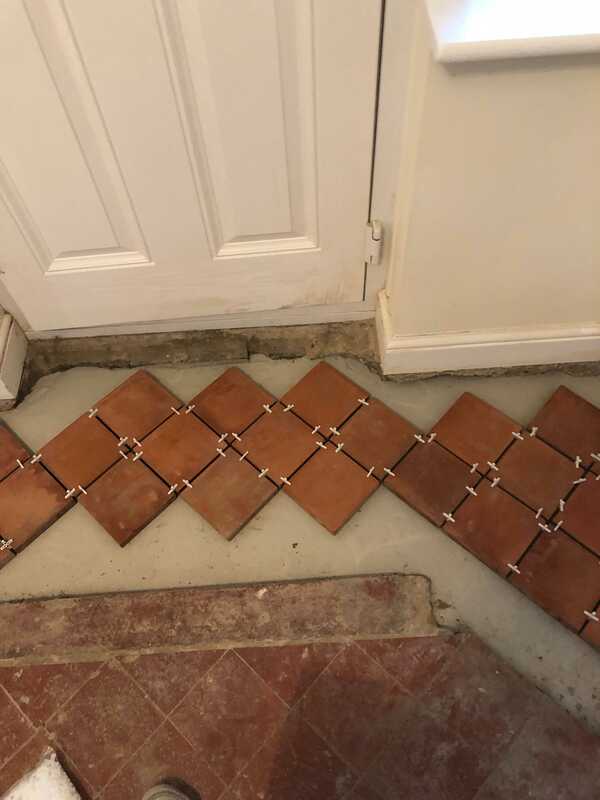 The customer had decided to go with a slightly different shade of tile for the extension as the original front door step had been left in the existing floor and would create an interesting feature between new and original. It turns out that the step penetrated deep into the substrate and could not be removed. I waited for the new surface to dry before laying out the tiles to find the best layout, then satisfied with the pattern the tiles were fixed in place using a flexible adhesive and grouted in. 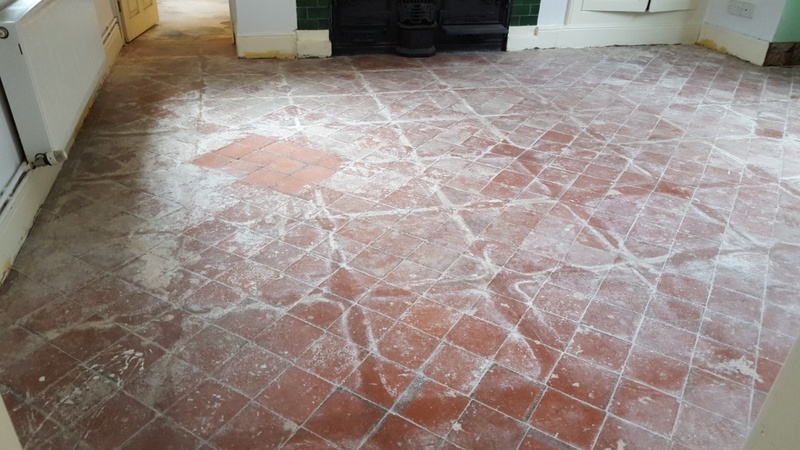 The next day we returned to restore the original Quarry tiled floor, firstly using Tile Doctor Remove and Go to break down any old sealer and paint. The product is sprayed on and allowed to dwell for a short time giving it time to penetrate. 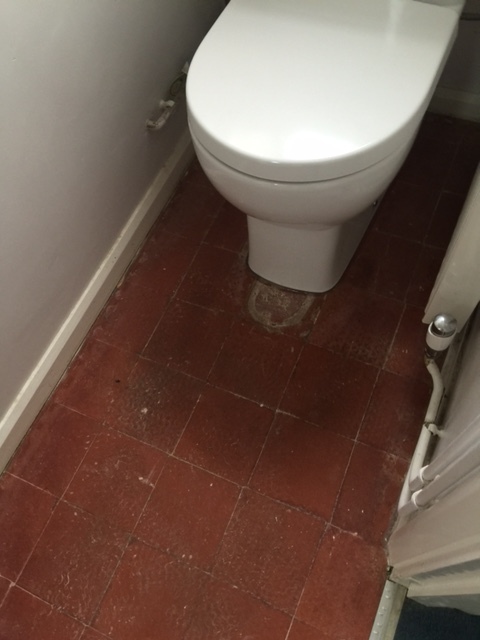 The product is then worked into the tile and grout using a rotary floor machine fitted with a scrubbing pad. The soil generated is rinsed off the floor with water and extracted using a wet vacuum. 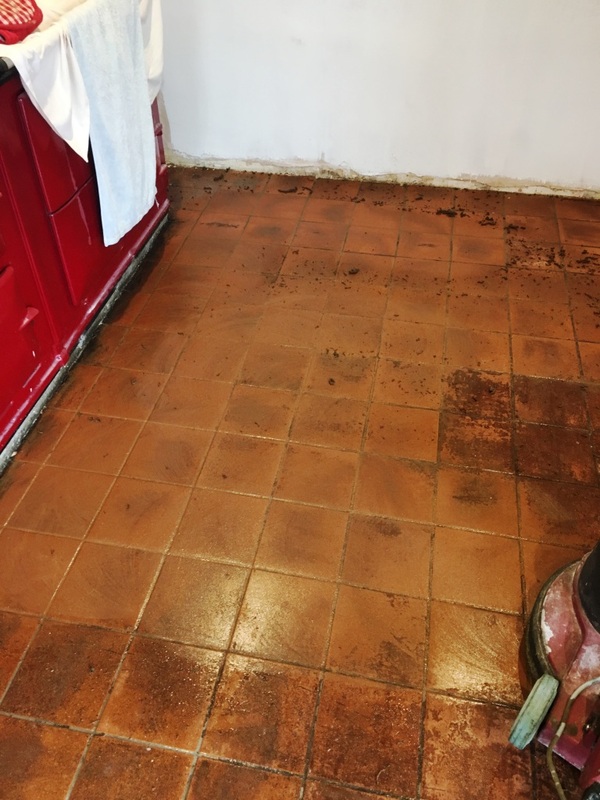 Next, I decided to give the floor an acid wash using Tile Doctor Acid Gel to remove any old grout smears and other mineral deposits that were affecting the appearance of the Quarry tiles. Again, the product was scrubbed in and then removed using water and the wet vacuum. Once that was done the floor was left overnight so it could dry out ahead of the sealing process. The following day the floor was check for moisture and then sealed with four coats of Tile Doctor Seal and Go Extra. This has a special acrylic-based formula which being fully breathable copes well with locations such as hallways where damp conditions are more likely. Seal and Go Extra also adds a nice subtle sheen to the Quarry tiles which enhanced their appearance and made the difference between the original and new tiles less conspicuous. The customer was very happy with the new floor and pleased that we had been able to match it so well to the existing. 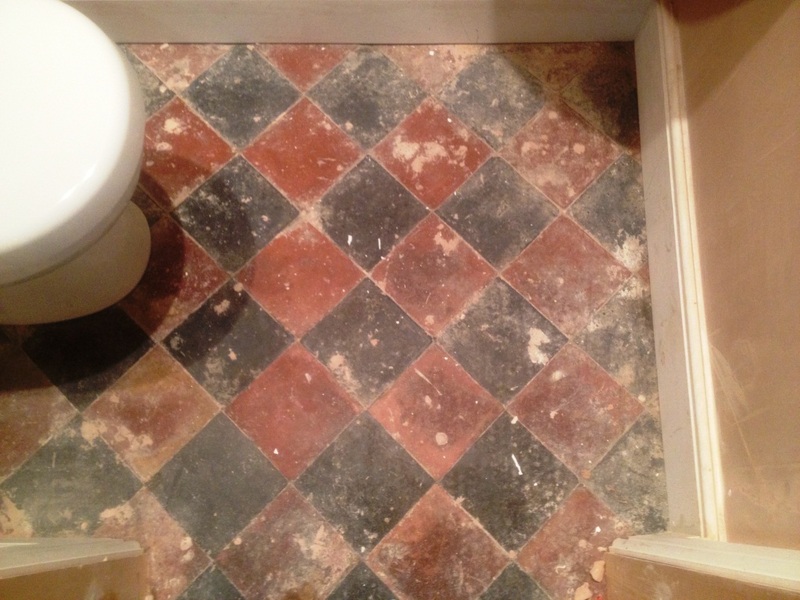 Pictures below of a Quarry Tiled floor that a customer had discovered when taking up the lino at her house in Coulsdon. 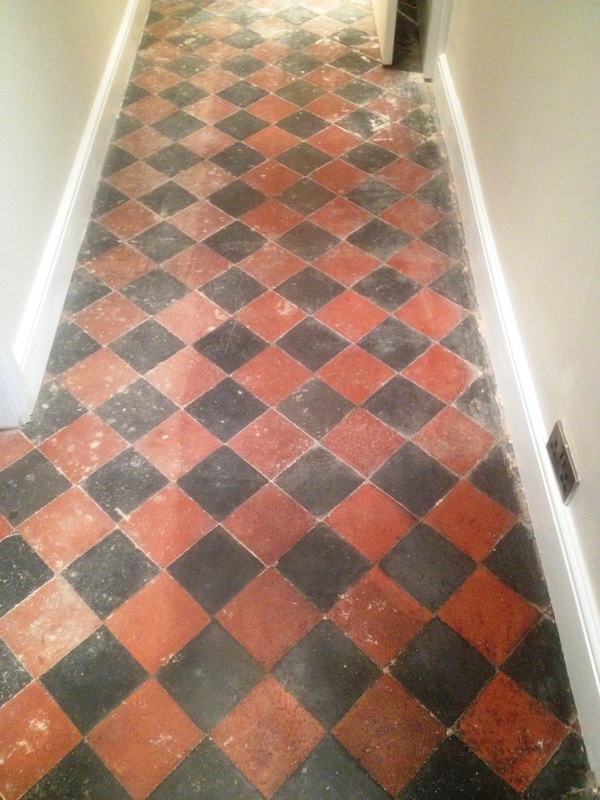 Realising the floor was original and worth saving she contacted Tile Doctor and I popped round to take a look. 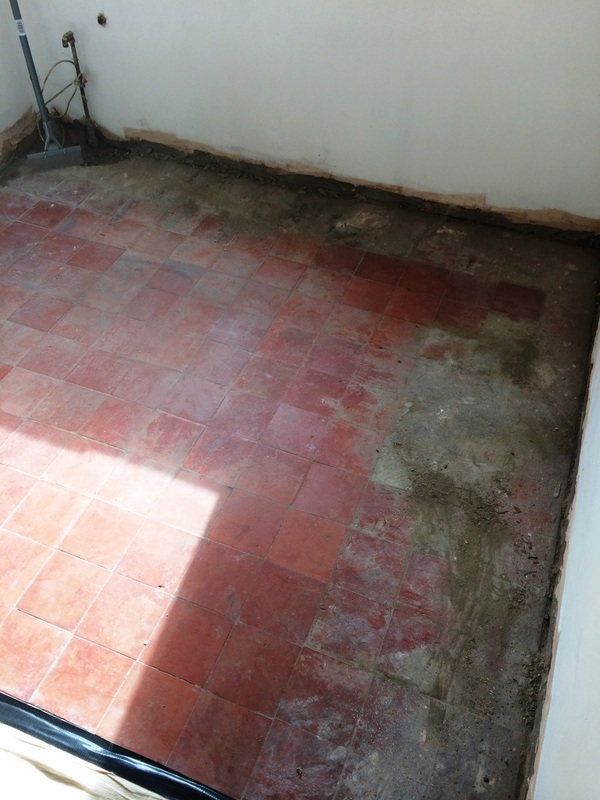 A lot of the tiles had been covered in a screed to provide a flat base for the Lino and that would need removing. In order to be sure what treatments would work to remove the screen and successfully restore the Quarry tiles without causing any damage I ran a couple of tests and everything seemed ok.
We could both see the job wasn’t going to be easy and would take some days to complete so I worked out a price which was accepted and we agreed a date for the work to start. 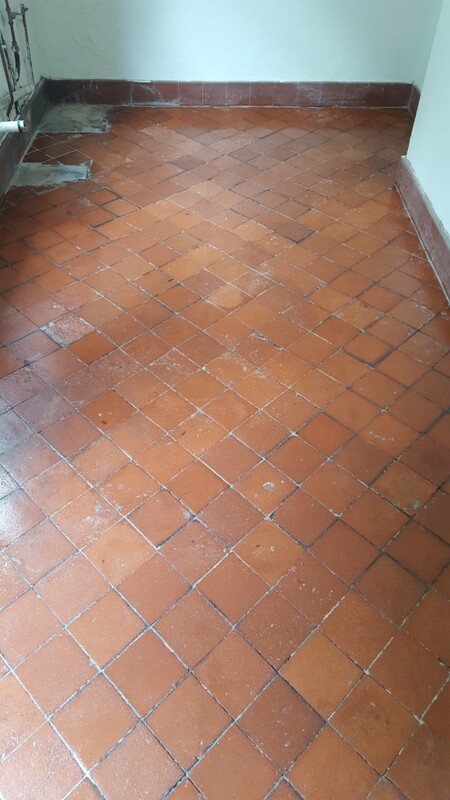 The Quarry tiles in the WC hadn’t been covered in Lino so they would just need a good clean and seal so the main work would be in the Hallway and Kitchen. Fortunately my customer was having a lot of other work done in the house and was in the middle of stripping the walls so I didn’t need to worry too much about protecting the skirting boards etc. Working in sections I soaked the screed in water and then carefully chipped away at it until it came loose, it was slow work but I could see the process was working as expected and eventually all the Quarry tiles were revealed. There was still a lot of cement from the screed stuck to the surface of the tile so after sweeping up the chippings I set to work applying a strong solution of Tile Doctor Grout Clean-up to the tiles and leaving it to soak in for a short while. Grout Clean-Up is an acidic product that we normally use for removing grout smears from the surface of tiles. The solution was scrubbed in and then rinsed off with water and extracted with a wet vacuum. 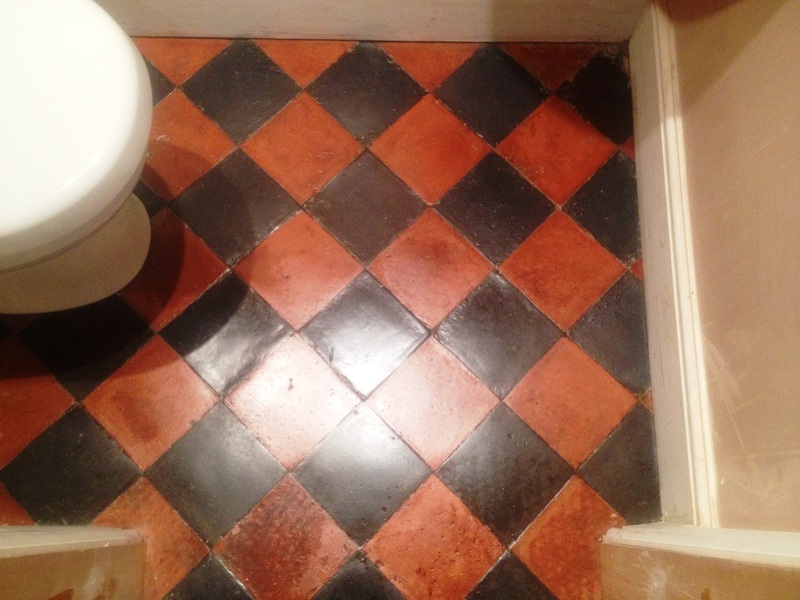 To get the tiles in the toilet clean I gave them a good scrub with Tile Doctor Pro-Clean which is a reliable and effective Tile and Grout cleaner. Once clean they were rinsed with water and dried with the wet vacuum. I had timed my visit between working being carried out at the property so I was able to leave the floor for a few days so it could thoroughly dry out. 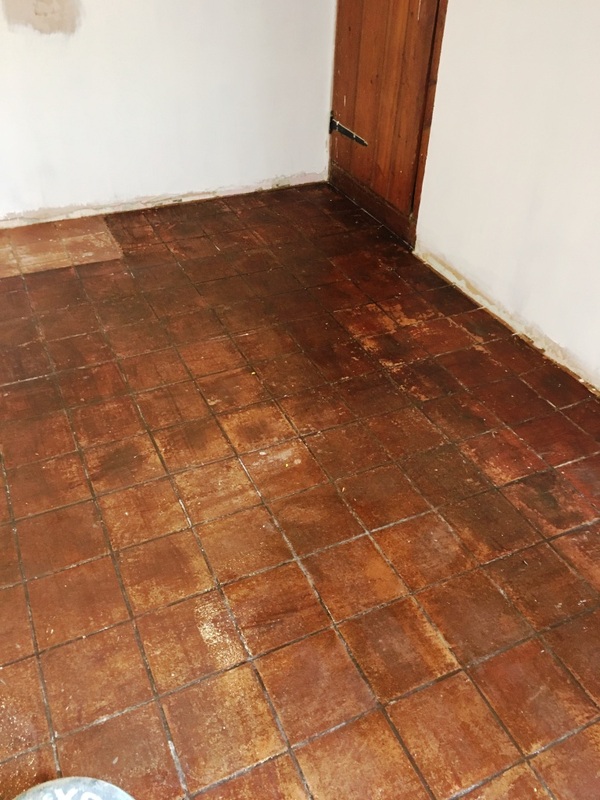 I returned later to check the Quarry tiles were dry and completed the renovation by sealing the floor with Tile Doctor Seal and Go which is a water based sealer that works really well on Quarry tiles. 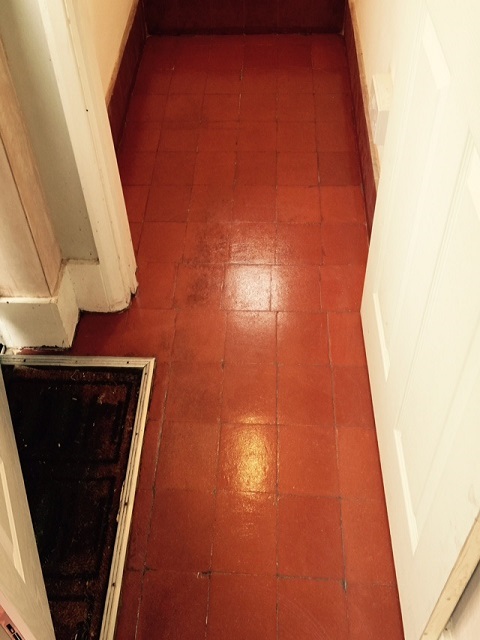 Five coats of Seal and Go were needed to fully seal the tiles and the floor now looks transformed. The owner was very satisfied with the improvements and before leaving I advised to cover the floor before starting the decorating work. 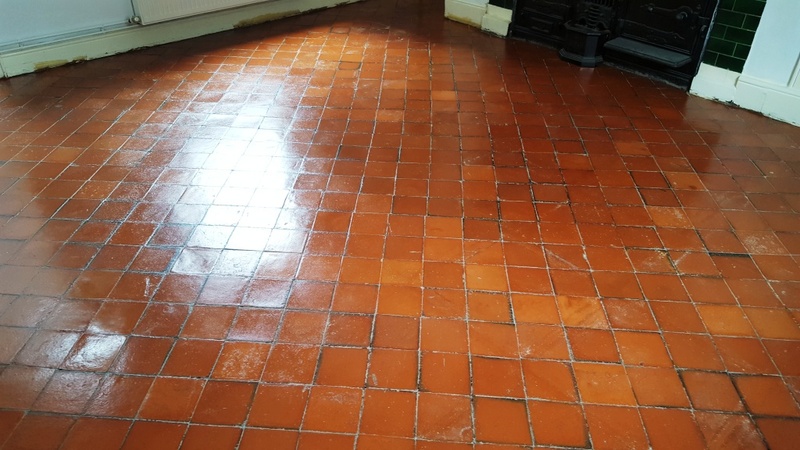 Details below of a restorative clean and seal we completed of an Edwardian Quarry Tiled Floor and Edwardian Geometric Floor at a house in the town of Market Harborough, Leicestershire. Market Harborough is a very old town that dates back to Saxon times, as a result it has some very old buildings including the church that was built in the 1300’s. Both floors had been hidden underneath carpets for many Years. 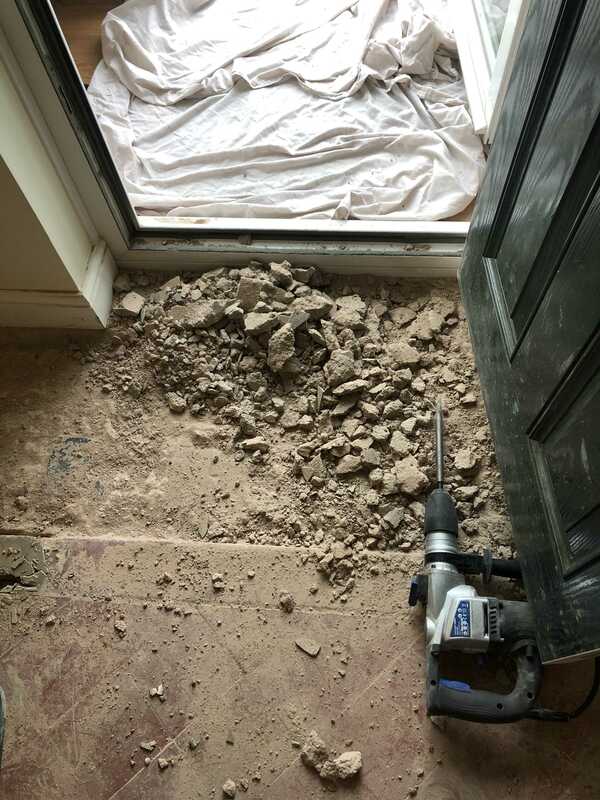 They were exposed by our customer thirteen years ago, who had painstakingly removed the cement-based levelling screed from the Quarry Tiled Kitchen Floor. 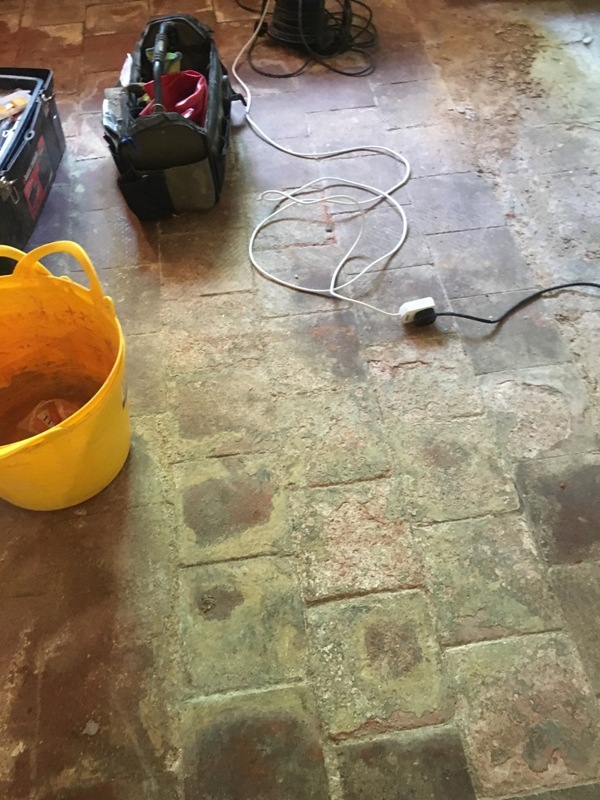 The floors were moisture damaged from years of inherent damp build-up and didn’t look their best with ingrained historic soiling and damage to the hall tiles. We were asked to quote for a restorative cleaning, sealing and repairs by our customer. After inspecting the floor, we quoted for the work and advised how long it would take to complete. 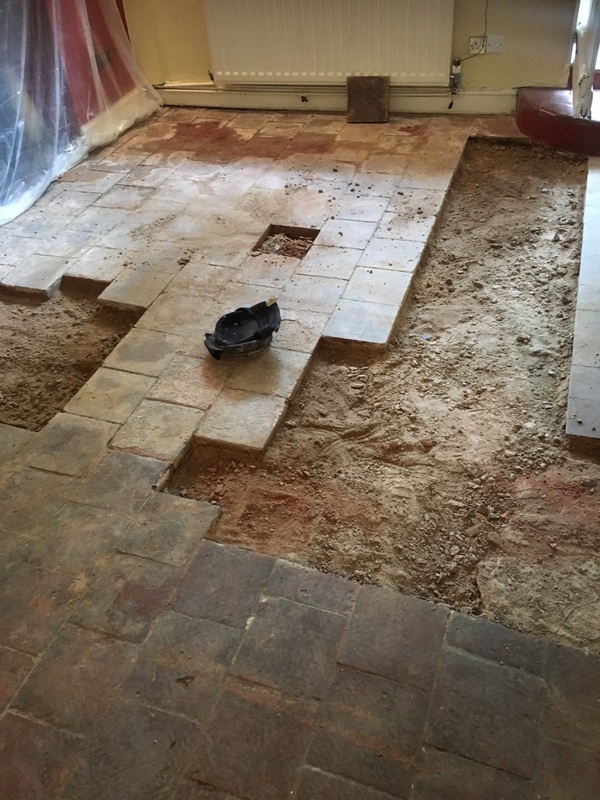 We also guided our customer where to purchase period reproduction tile replacements from. In this instance our customer purchased made to order tiles from world renowned tile manufacturer Craven Dunnill in Bridnorth, Shropshire. 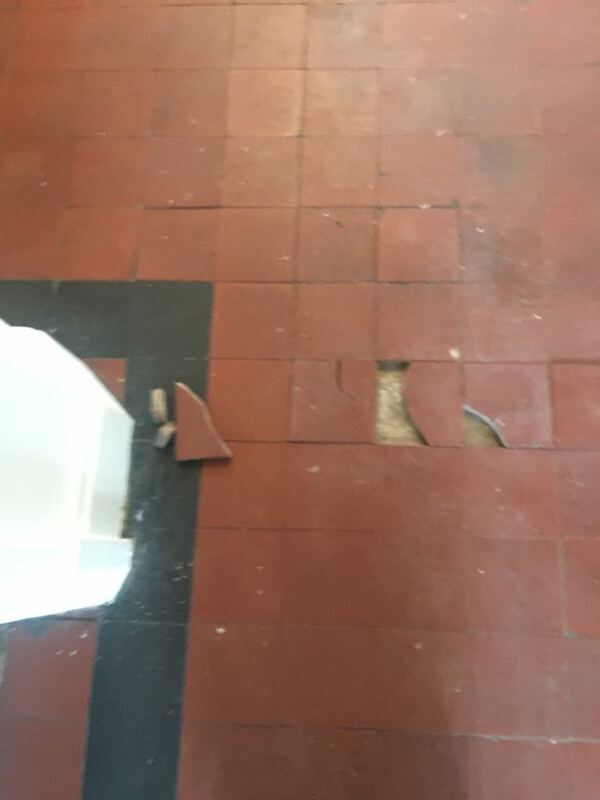 We carried out repairs first carefully removing the damaged tiles and fixing in place the replacements purchased by the customer. Some of the original tiles were also loose but in good physical condition so these were re-fixed in place and grouted in. 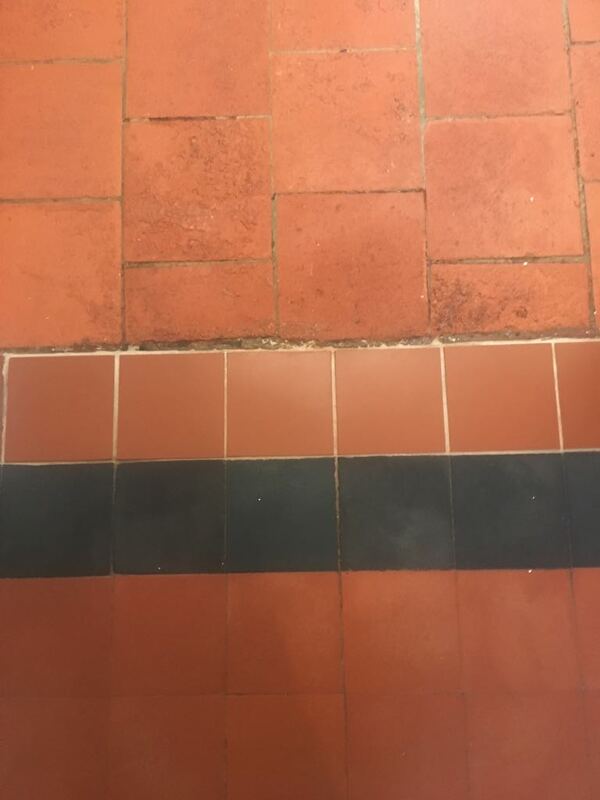 Once the grout had set we started the cleaning process with the application of Tile Doctor Remove & Go ready to use heavy duty cleaning solution and coatings remover to the tiles. Working in small sections we allowed the product to soak into the tile for thirty minutes and then agitated the solution, with both an abrasive brush and a coarse 200 grit pad. This process quickly broke down the years of soiling and surface contamination. 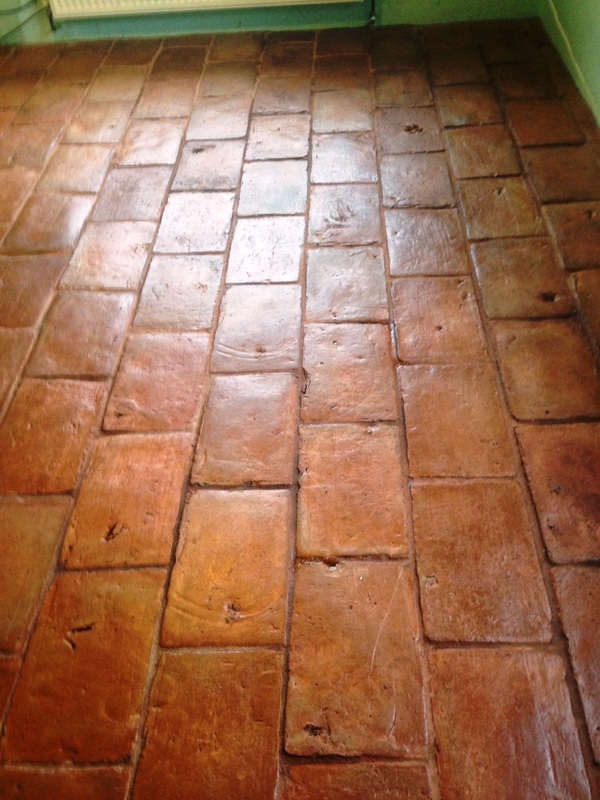 We extracted the resulting slurry and followed up with the application of Tile Doctor Acid Gel to treat inherent cement contamination and historic efflorescence salt staining. This was again worked into the tiles and the floor rinsed using low moisture methods. We had arranged to seal the floor the next day, so air movers and a fan heater were left in place to help dry the floor overnight. On the second day after confirming the tiles were dry we sealed the tiles with four coats of Tile Doctor Colour Grow which is a colour enhancing sealer that soaks into the pores of the tile protecting it from within. The floor was then buffed by hand to remove excess sealer and was ready for use within the hour. We advised the customer that whilst the floor could be walked on quite quickly, that the sealer would take up to 48 hours to fully cure. Before leaving we advised the customer that the sealer can be prematurely worn down by the use of strong cleaning products and so recommended the they use Tile Doctors pH Neutral Floor Cleaning concentrate. This should always be diluted correctly, and the water changed frequently, to avoid suspended soils from being deposited back onto the surface of the floor. If properly maintained, then the sealer should last a minimum of 5 years. 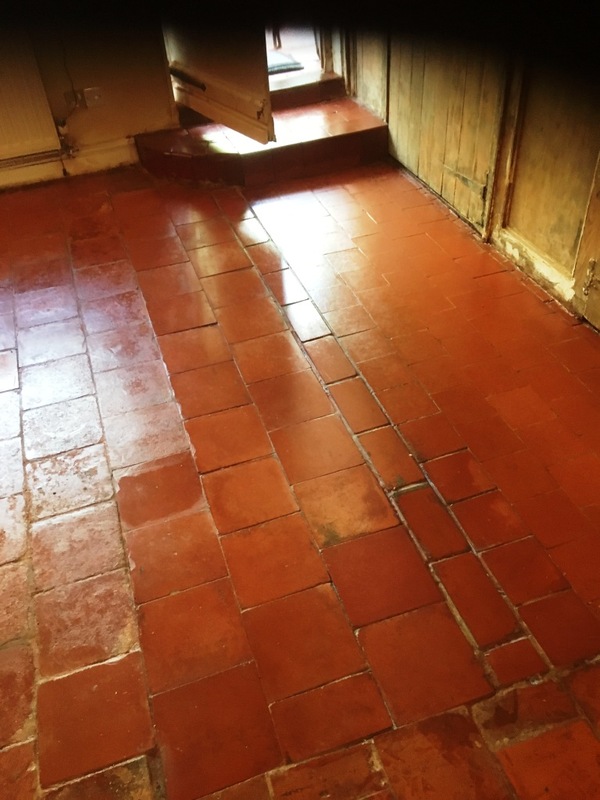 Looking at the pictures below you might think this Quarry Tiled kitchen floor at a cottage in Rotherfield was as old as the village which dates back to the 8th Century and is mentioned in the Doomsday book. It really was in a bad state with I don’t know what covering the tiles which had gone black as a result but were actually very pretty as you will see later. The client was having a new kitchen fitted and wanted the tile and grout restored so as not to incur the cost of replacing it. 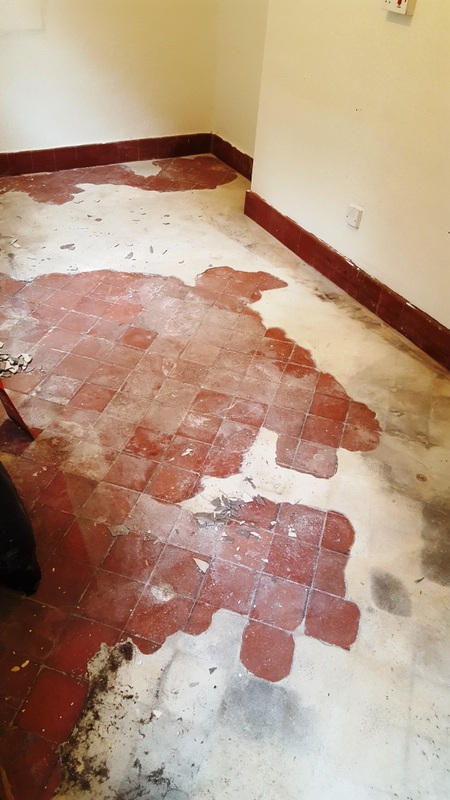 This really is the best time to look at getting your tiles thoroughly cleaned as with many of the old units removed I could access most of the floor and of course I didn’t need to worry about protecting the units either. I could see this floor was going to be a challenge so decided to try a strong cocktail of Tile Doctor Pro-Clean and Nanotech HBU, HBU stands for Heavy Build-Up so quite appropriate I thought. Working in sections the floor was soaked in the cleaning cocktail and left to dwell for some time in order to soften the dirt and grime. The next step was to run over the tiles with a set of Burnishing pads which are encrusted with industrial diamonds. It took more than one attempt at this process but the abrasive pads had the desired effect and eventually revealed the beautiful quarry flooring below. The pads are effective on the tiles but the grout sits a little lower and so to reach these a stiff brush was scrubbed into the grout by hand. To remove the dirt that was released from the cleaning process and further clean the tiles I used a Spinning Tool through the process. The tool is powered from a large compressor that sits in my van which forces hot water under pressure onto the tiled floor whilst simultaneously extracting the dirty water back to a tank on the van. It’s an amazing tool that is very effective however you do need to have the van parked very close the house due to a limitation on the hose lengths. With the tiles now clean and rinsed with water the floor was dried as much as possible with a wet vacuum. The floor was left to dry for a couple of days before I returned to complete the restoration with the application of a sealer. I tested the floor with a damp meter on my return to ensure it was dry; all was well so I moved onto sealing. Sealer of choice on this occasion was Tile Doctor Seal and Go which is a water-based sealer which so it doesn’t leave a smell as it dries. 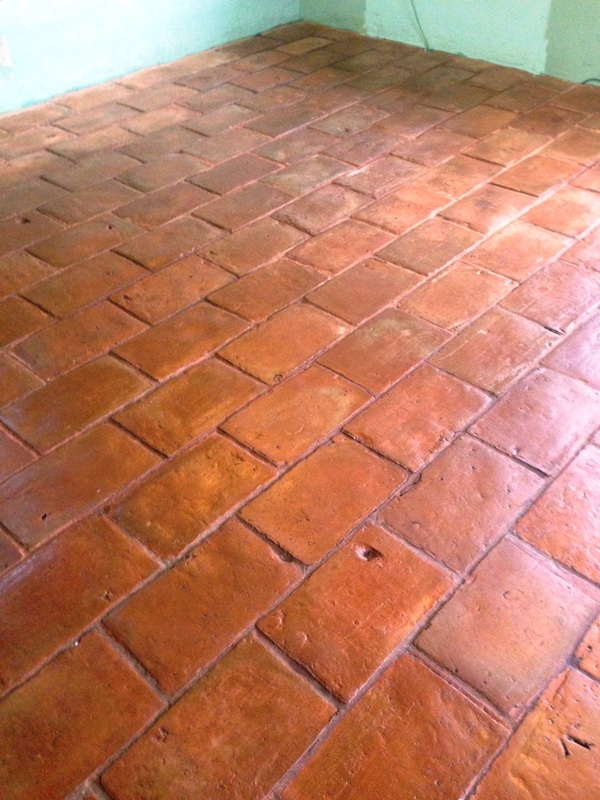 The Quarry tiles were quite porous, which is not uncommon for Quarry Tiles and six coats of sealer were required in the end. 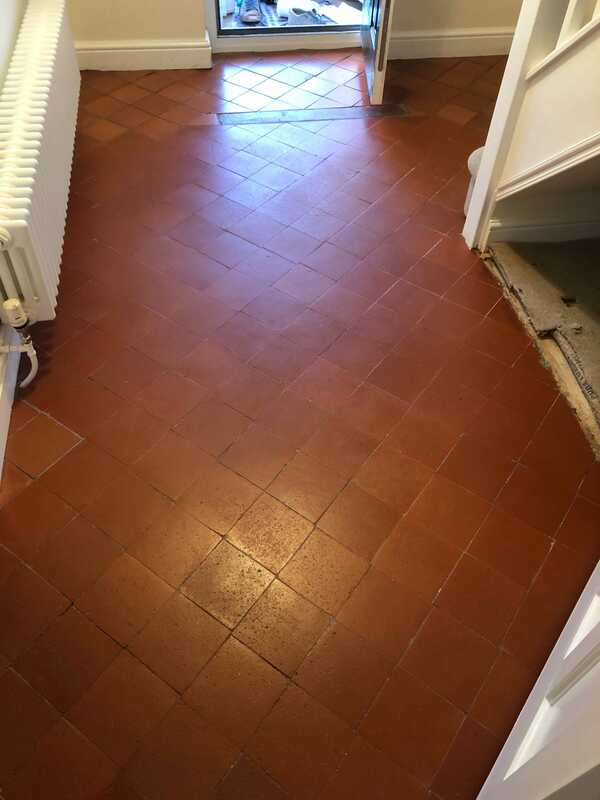 The owner of this Quarry tiles floor at a house in Swansea had expended much effort in its restoration and feeling exhausted decided to call in their local Tile Doctor to finish it off. I never saw the original flooring but I could see it had been covered by some sort of cement screed which had probably been used, judging by the imprints, to support large carpet tiles. I’ve come across a few floors like this, you can’t simply put carpet over a tiled surface as tiles can be slightly convex in shape and the grout lines result in dips forming in the carpet so as a result a floor levelling compound is usually applied beforehand. After doing a cleaning sample and a test to see how stubborn the cement compound was to remove I agreed with the customer that it was possible and showing her the test results, she was happy to proceed with the work. 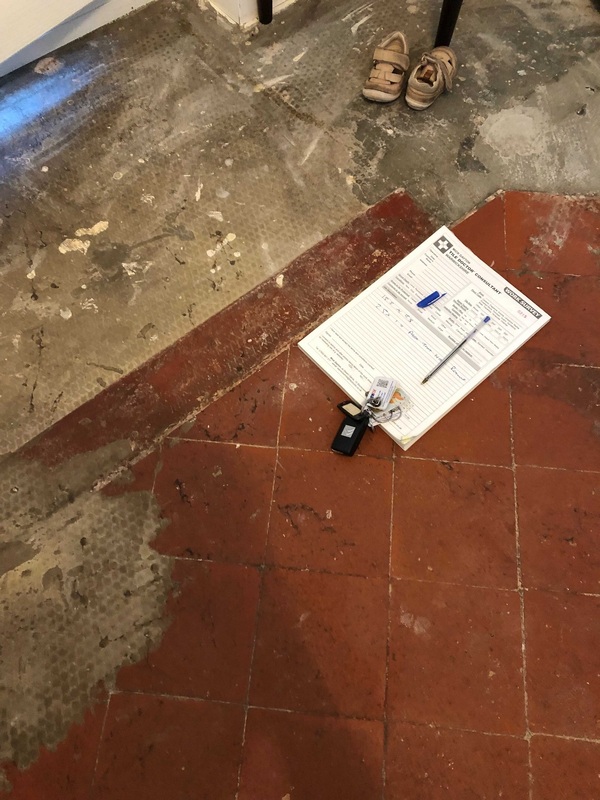 Before starting I took a few moisture readings with a handheld damp meter, I always recommend doing this at the start as it gives you a baseline reading that can be used to determine the floor has dried and ready for sealing later. 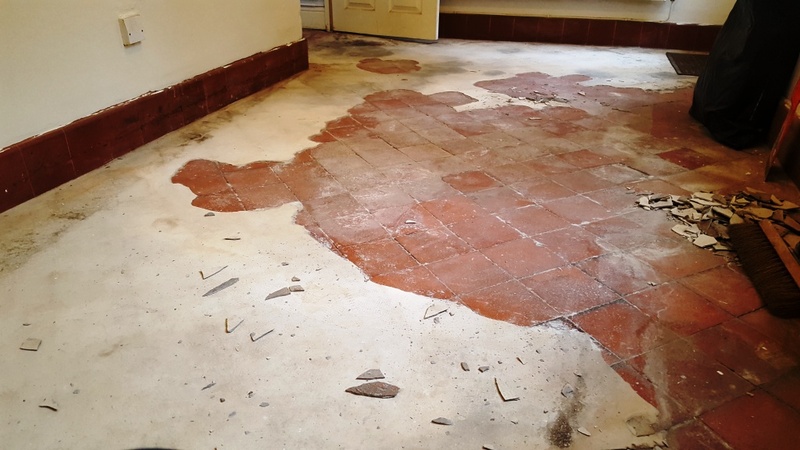 Most old floors don’t have a damp proof membrane installed and so if the moisture readings were high I would recommend coming back to seal the floor at a warmer part of the year. 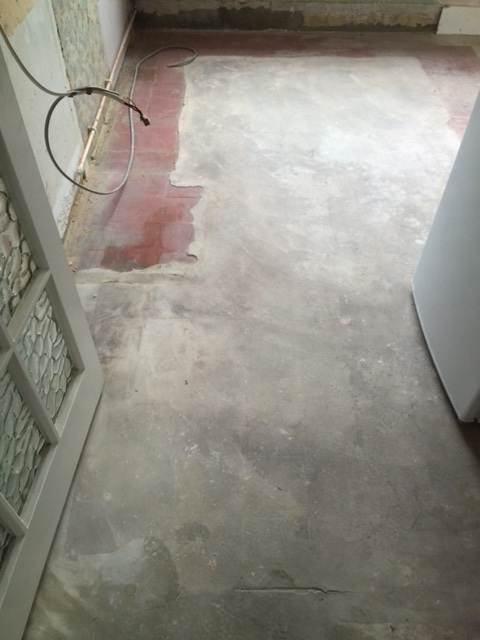 The first step was to remove all the cement compound from the surface of the tiles and then scrape as much paint and plaster off the tiles before cleaning with an undiluted mixture of Tile Doctor Pro-Clean and Remove and Go. This combination of two different products make a great team; Pro-Clean is a versatile, high alkaline cleaner that is used to deal with reasonably heavy soil build-up on natural stone and Tile. Remove and Go, also safe to use on natural stone and tile is specially formulated to remove old coatings including paint and old sealers. 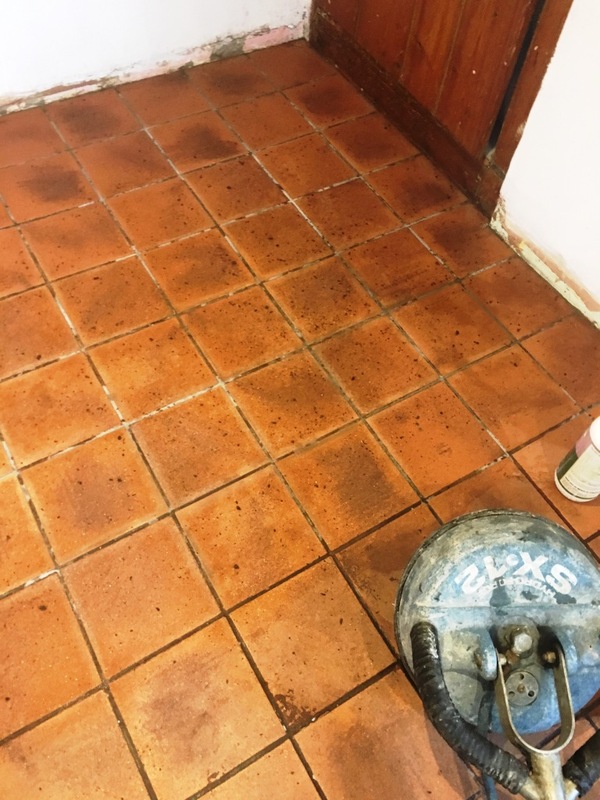 This solution was applied to the floor and, working in small sections, I scrubbed it into the tiles using a rotating scrubbing machine fitted with a nylon brush attachment; it was also scrubbed into the grout using a stiff brush. The floor was then rinsed, and the resulting cleaning slurry was vacuumed away using a wet-vax machine. 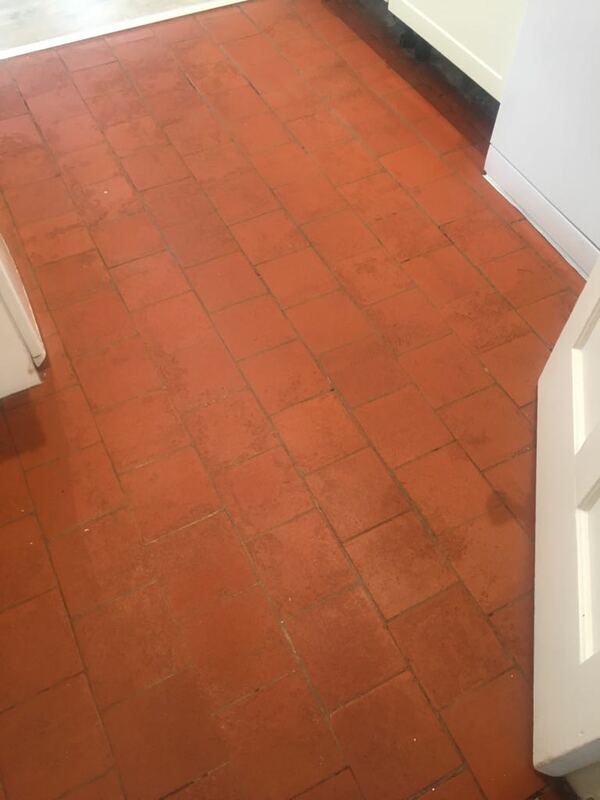 The final stage of the cleaning process was to run over the tiles with a coarse 200 grit diamond pad together with Grout Clean-up which is another Tile Doctor product that removes mineral deposits such as old grout and cement smears. 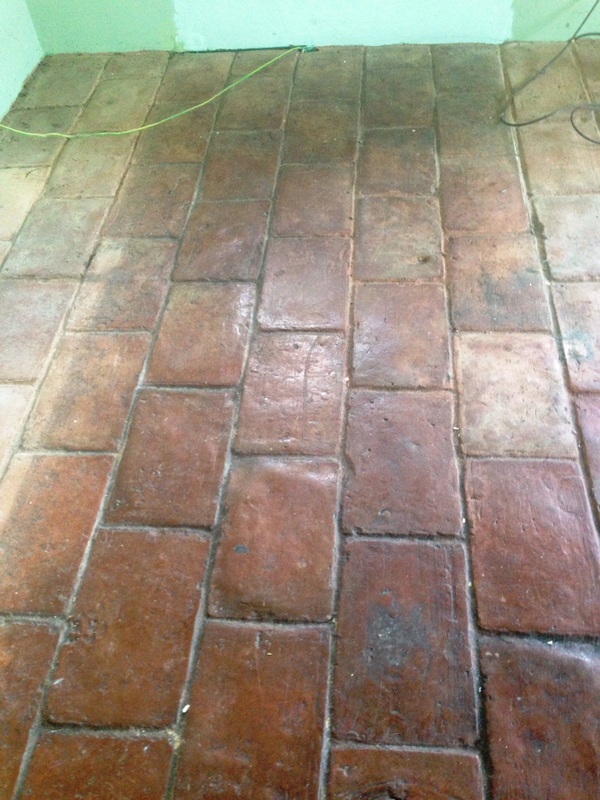 After a final rinse I could see the all the cement had been removed and the Quarry tiles were looking much healthier and ready for sealing. I left the floor to dry out overnight with the aid of heater fans and all doors closed to keep it warm. When I returned the next day, I retested the floor for moisture and compared the initial readings to confirm the floor was ready for sealing. 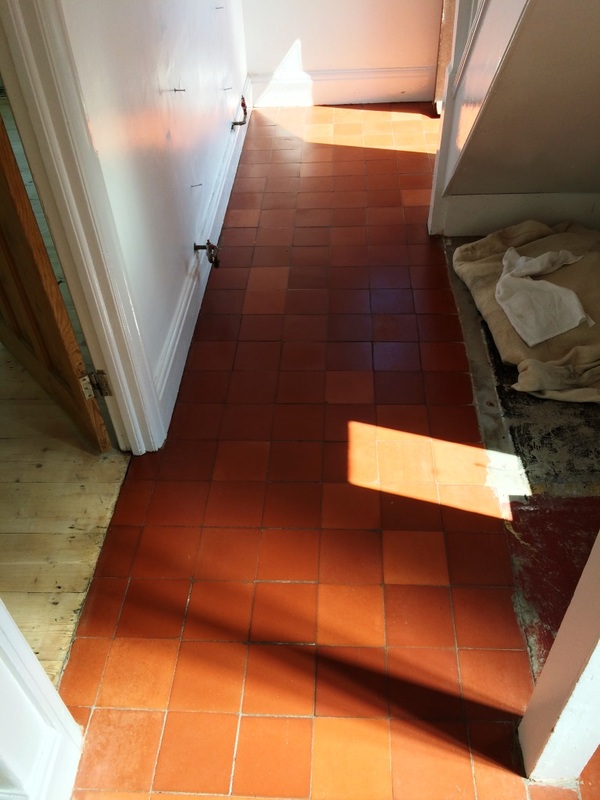 The Quarry tiles were quite porous so to seal the Quarry tiles, I eventually used eight coats of Tile Doctor Seal & Go which not only provides a protective covering but also enhances the colours of tiles especially old red quarry floor tiles. The customer was thrilled with the results of the floor and was so impressed told me she was going to recommend Tile Doctor to her friends. Pubs have been though a decline in the last ten years with one in five closing due to increased business rates and some believe the ban on smoking has had a part to play. My client saw this particular pub come up for sale in Newbold-on-Avon near Rugby and snapped it up with the intention of turning the lovely thatched Cottage back into a home. 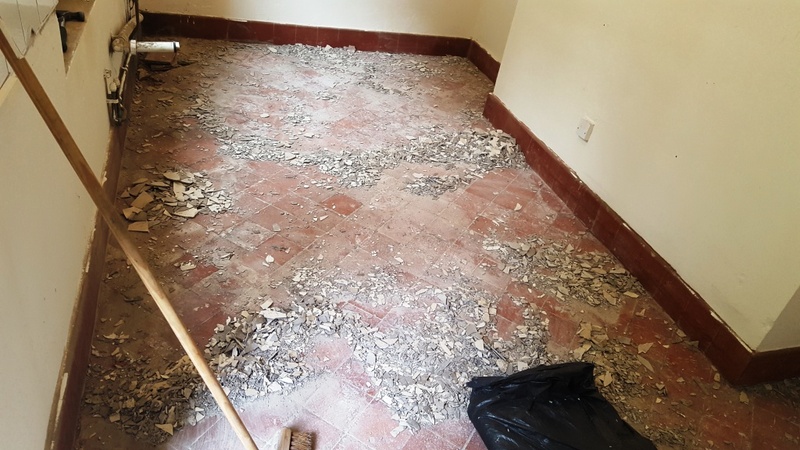 It needed a lot of work though and I was called into to sort out the floor which was a mixture of 6×6 inch and 9×9 inch Quarry tiles. The tiles were in a bit of a state and there were also large sections of concrete in 3 areas that had been painted red to blend in with the tiles. 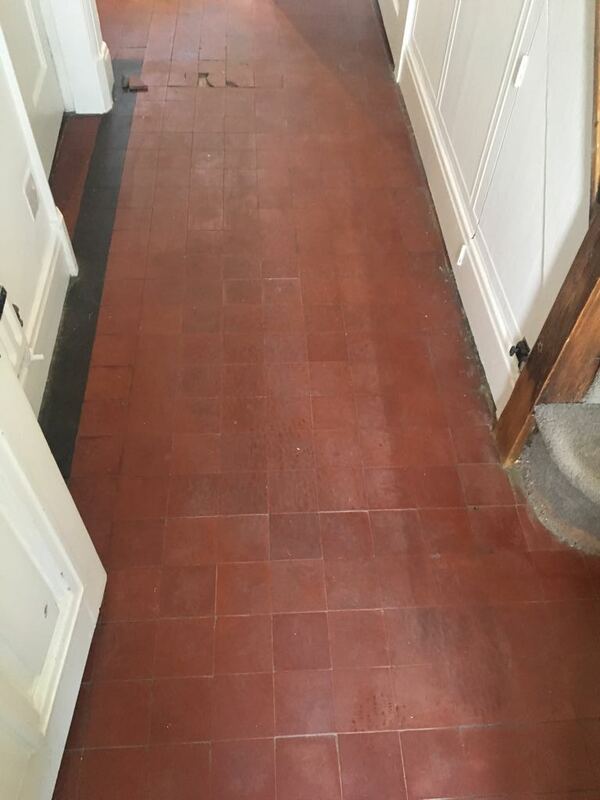 The customer wanted the Quarry tiled floor restoring and extended throughout the floor which meant a substantial amount of work would be required to remove the concrete, rebuild the foundation and level with screed and then fit around 100 reclaimed tiles not to mention cleaning and sealing. The work was hard going at times, especially knocking out the concrete and adding the screed surface to the right level. Once that was done worked moved quickly on to laying the new tiles and grouting them in. Overall it took three days just to rebuild the floor alone. 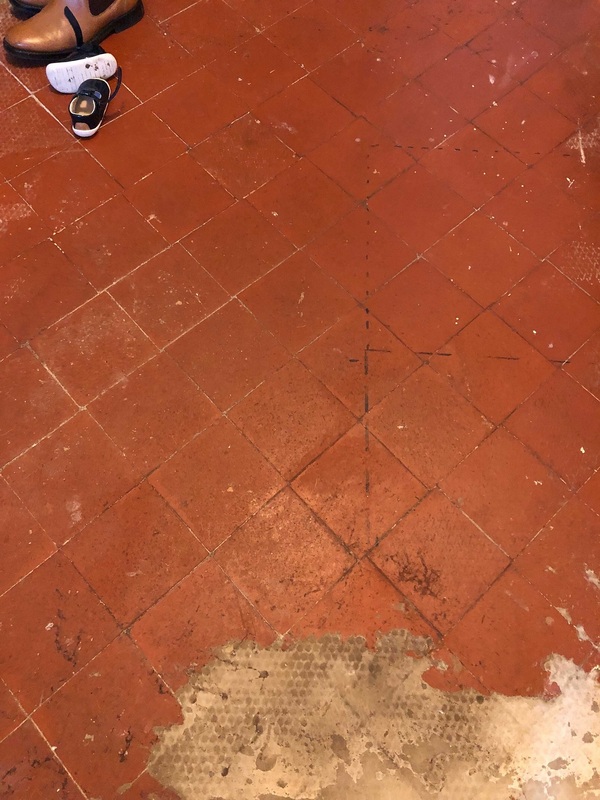 The customer did not what the Floor to look too different between the old and new so once the tiling was done the whole floor was treated with Tile Doctor Remove and Go to remove traces of red paint and glue. The solution was scrubbed in using a rotary machine fitted with a scrubbing pad and then rinsed off with water and then extracted using a wet vacuum. 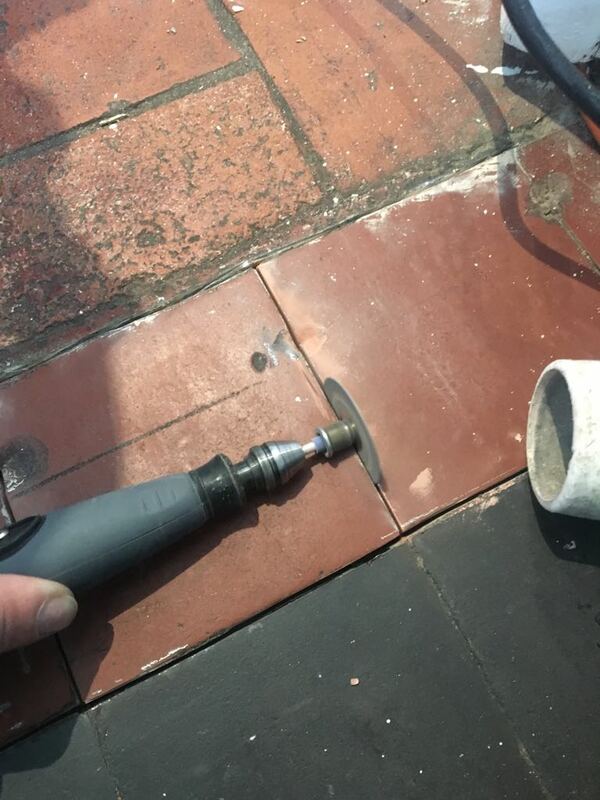 This improved the look of the tiles but it also revealed some grout haze issues on the original tiles and after digging up the floor earlier I was aware no damp proof course had been installed which is not unusual in these older properties. To counter the grout haze and deal with any potential efflorescence issues I gave the whole floor an acid wash with Tile Doctor Grout Clean-up which was scrubbed in and then rinsed off with water and extracted with a the wet vacuum. The tiles need to be dry in order to be sealed so I left the floor for 24 hours with a number of industrial Air Movers in place to aid the drying process. Upon my return to the house I checked for any dampness that could have damaged the performance of the sealer, thankfully, the floor was dry and ready to seal, and so I proceeded to apply several coats of Tile Doctor Seal & Go Extra. Seal & Go Extra is a fully breathable sealer that allows for effective moisture transmission, important where no damp proof course is installed. 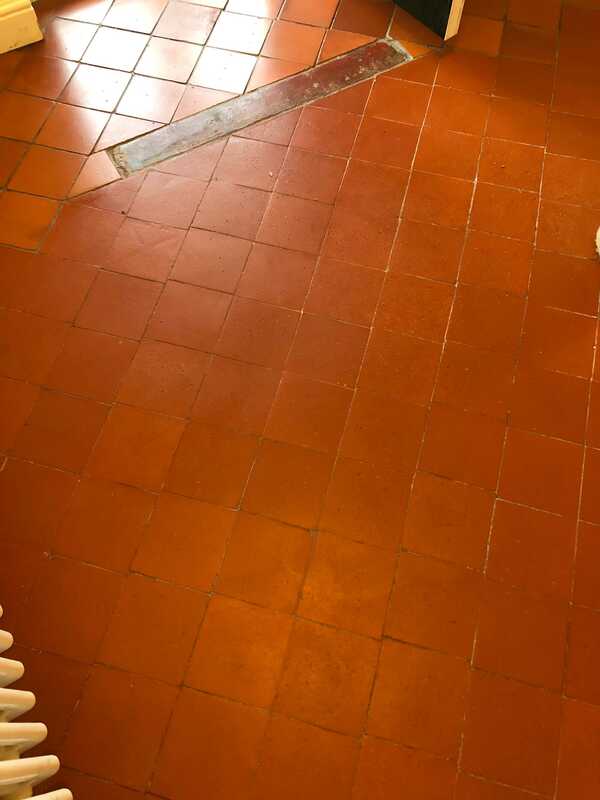 The sealer provides durable surface protection against dirt and stains, and is suitable for most kinds of internal, natural stone tiled floors, including Quarry, Victorian and Flagstone. The job took a week in total and as you can see from the photographs I successfully managed to restore the old tiles which with the addition of the cleaning and sealing have blended in well with the new tiles. 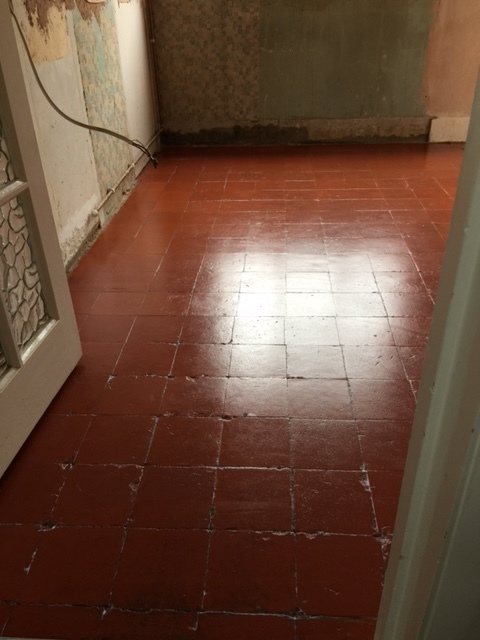 The history of this Quarry Tiled floor at a house in Swindon is a little unusual in that the owner had discovered the Quarry tiles underneath cracked ceramic tiles which had been laid over the top for several years. 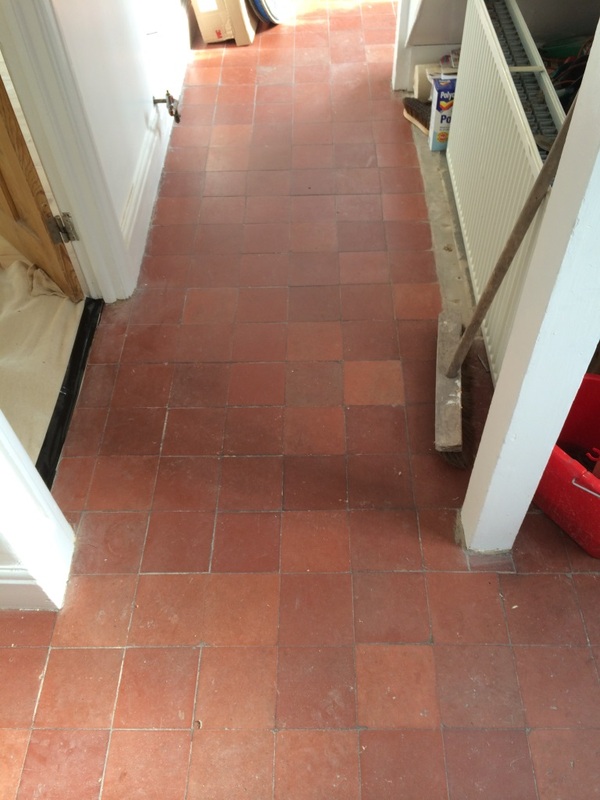 The customer wanted to bring the Quarry tile back to life to match the existing hallway from the kitchen and so we got a call. 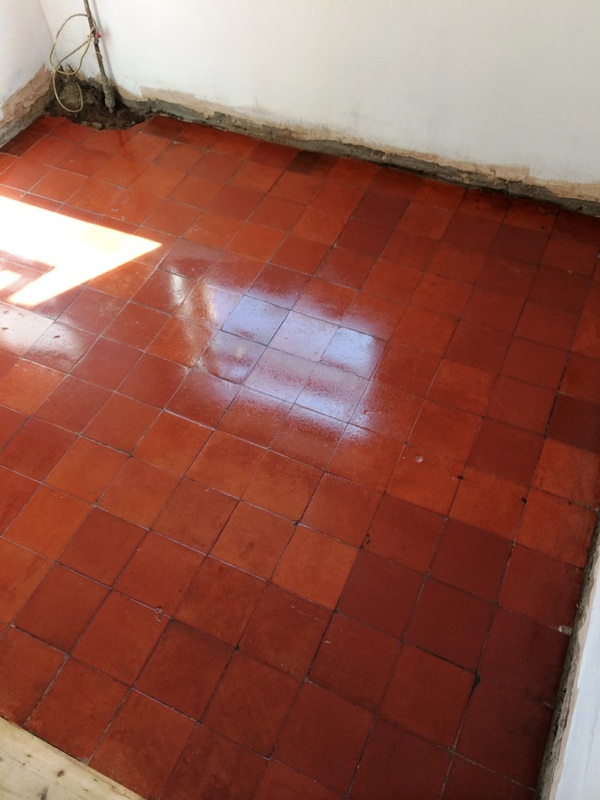 Incidentally the practice of laying new tiles on top of old is not unusual as an existing tiled floor provides an ideal level on which to lay new tiles. We started by using a floor scraper to scrape off as much tile adhesive as possible. Once this was done we mixed a strong dilution of Tile Doctor Grout Clean-Up and brushed it all over the remaining tile adhesive and used a black scrubbing pad attached to a rotary machine to remove the glue. This took several attempts using more Grout Clean-up, a floor scraper and a black scrubbing pad to remove all traces of the adhesive. Next we rinsed off any trace of product using clean water and then removed it using a wet vacuum. The floor was free of glue at this point but we still needed to remove any existing sealer from the tiles and give them a deep clean to remove ingrained dirt so a strong solution of Tile Doctor Pro-clean mixed 50/50 with Nanotech Ultraclean was applied to the tiles and left to dwell for twenty minutes. (The Nanotech product adds tiny abrasive particles to the mix making a more effective cleaner). The solution was worked into the tile using a black pad attached to a rotary machine and the floor thoroughly scrubbed. Once satisfied the tiles were rinsed with clean water several times to remove any trace of cleaning product and the water removed using a wet vacuum. A lot of work had gone into the floor at this point and it needed time to dry before sealing so we left for the evening. We returned two days later and after testing the tiles were dry using a damp tester, which came back as OK, we processed to seal the Quarry tiles using six coats of Tile Doctor Seal and Go which is an ideal sealer for Quarry tiles as it adds a nice sheen to the floor as well as providing future surface protection. Seal and Go is also water based so there’s no smell as it dries. 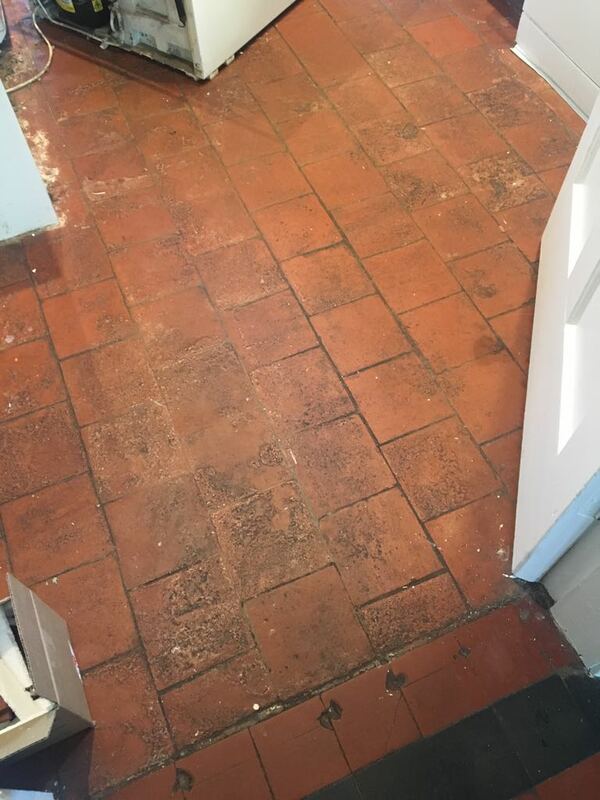 This Quarry tiled floor was in the hallway of a residence in Great Ouseburn near York, the tiles were in a dreadful state with plaster, carpet glue and what appeared to be one hundred years of dirt. 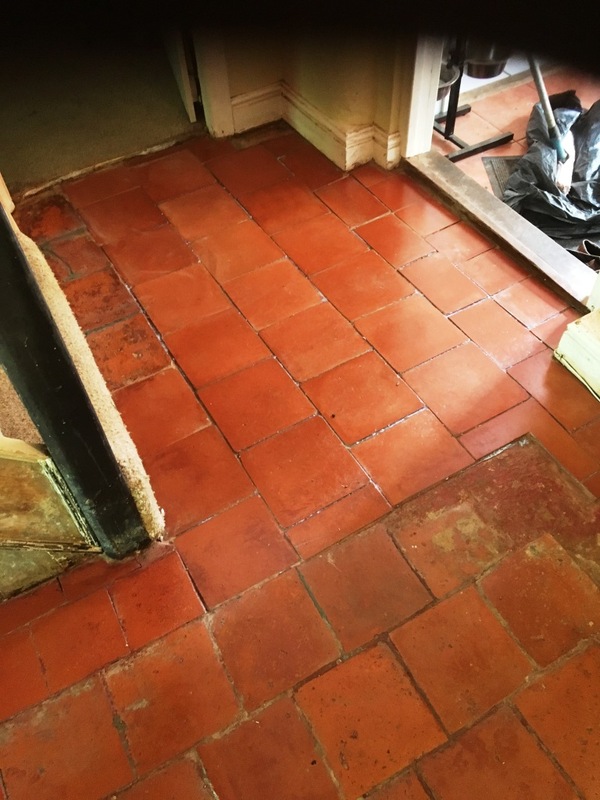 Were often being asked to restore old tiled floors that have been hidden under carpet since the 1970 when taste’s changes and this one seemed no different. To tackle the glue the floor was covered with a dilution of Tile Doctor Remove and Go which was left to dwell on the floor for an hour to soften before being scrapped off with a paint scrapper. 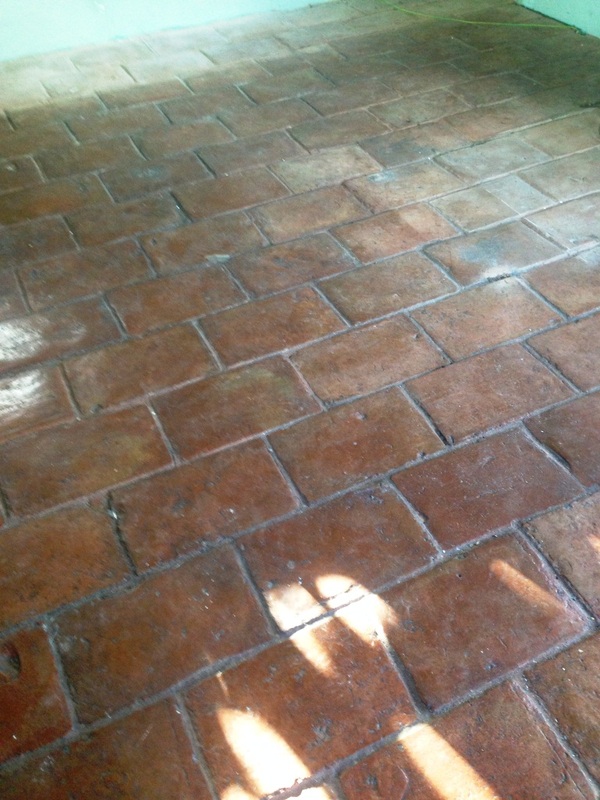 I should mention Remove and Go is a powerful coatings remover which is safe to use on tile and stone. Once happy with that all traces of the glue had been removed the floor was washed down with clean water and the solution was removed using a wet vacuum. 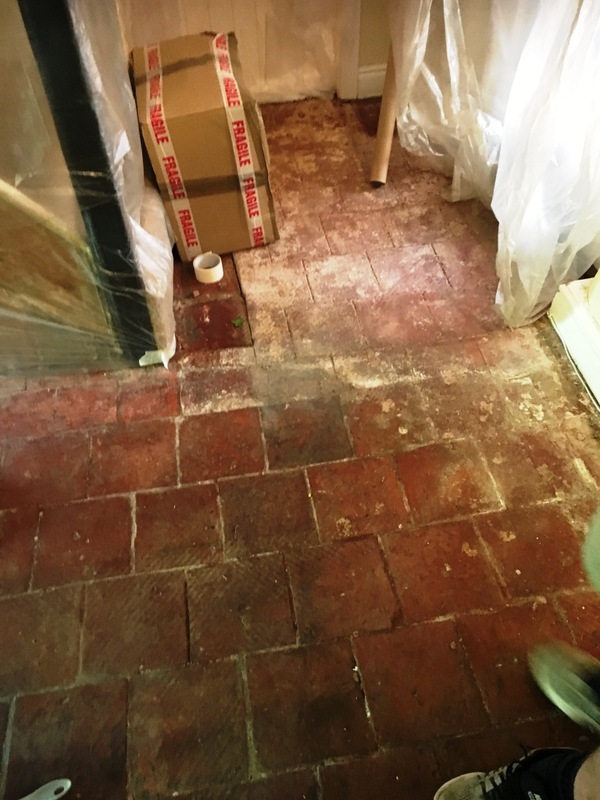 The plaster was then attacked with Tile Doctor Grout Clean-Up which is an Acid based product that we normally use for removing grout smears from tiles however it works just as well with plaster and can also remove mineral deposits and rust stains. You have to be quick with an acid on tile though as prolonged exposure can damage the tile, once done the tiles were washed down again. The next step was to scrub the whole floor using a rotary machine fitted with a black scrubbing pad and a strong one to one dilution of Tile Doctor Pro-Clean to ensure we have removed all the dirt and grime for the tile, again once done the floor was rinsed with clean water to neutralise the tile before sealing. The wet vacuum was used again to remove the soiled cleaning solution and reduce the drying time of the floor. We returned the next day to seal the floor which we did using four coats of Tile Doctor Seal and Go which will provide protection going forward and also leaves a beautiful satin finish on the surface of the tile. The customers were very surprised and happy with the results, it’s a great bonus when you exceed a customer’s expectations. 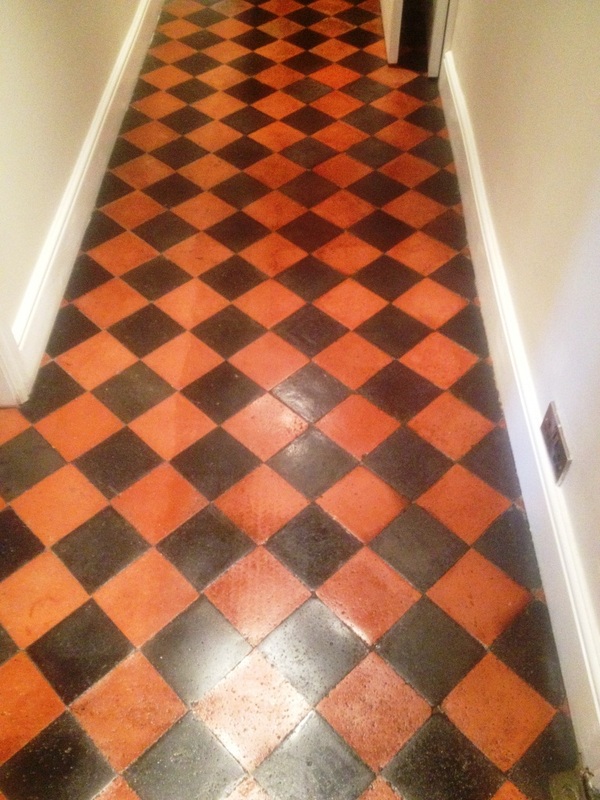 A while ago I was asked to quote to clean up an old quarry tiled floor in a converted barn in Ashtead. 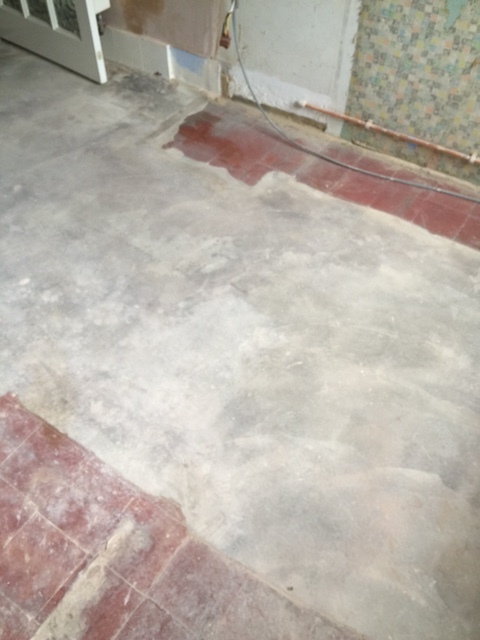 Whilst I was there I carried out a test patch for the lady to show what the results would be; she had said that if she wasn’t satisfied she was going to replace the floor so she must have met her expectations as a week later we were given the go ahead to carry out the work. Fortunately for us they had recently removed the old kitchen and scheduled us after to clean the quarry tiles before completing the decorating and refitting a new kitchen. 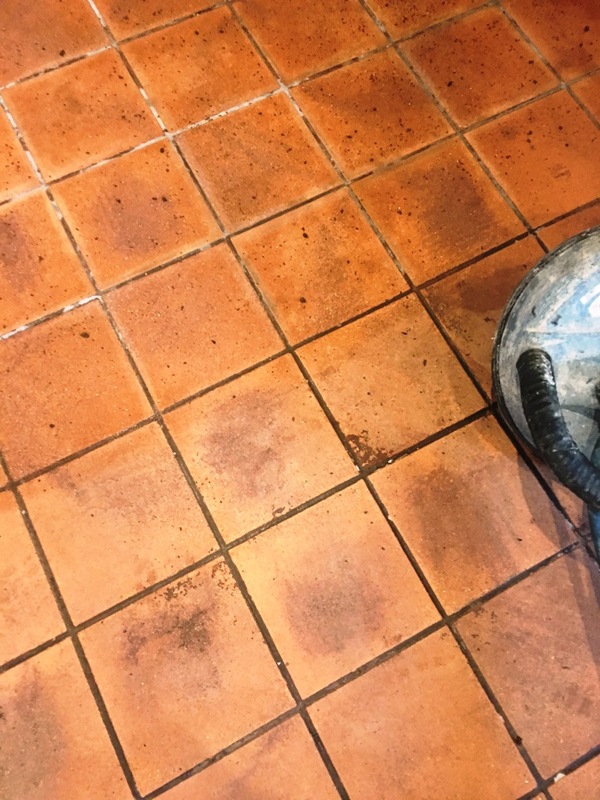 We cleaned the tiles using a mixture of Tile Doctor Pro-Clean diluted 1:4 parts with water and Nanotech Ultraclean which adds tiny abrasive particles into the cleaning solution. Normally I would work this into the floor using a black scrubbing pad however the floor was very uneven so I used a medium nylon brush on my rotary machine instead, this had the added advantage of reaching into the grout as well. I should mention we thoroughly rinsed the floor as we went along using a wet vacuum to remove the soiled solution. It took two of us two days to scrub the areas that had to be done and we had a blower running to help dry out the floor. We returned three days later and carried out moisture test to ensure the floors were dry and ready to be sealed. 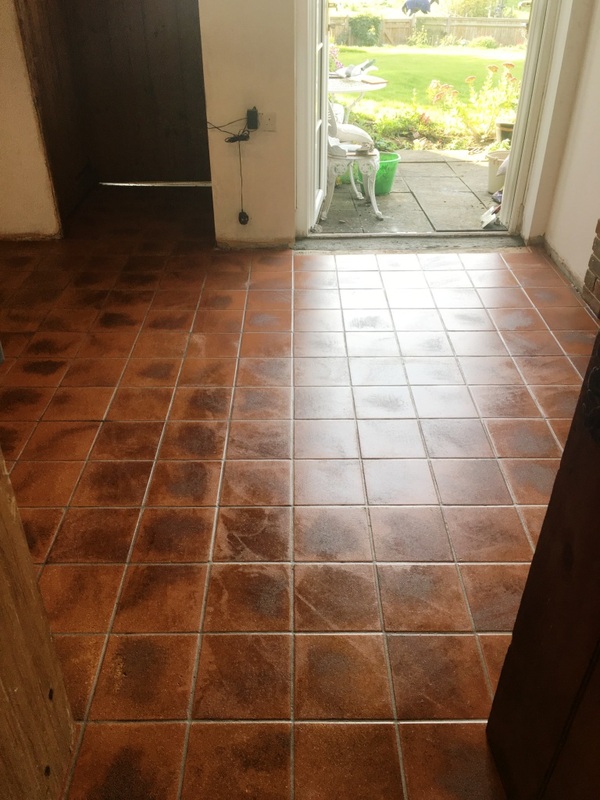 The Quarry tiles were then sealed them with five coats of Tile Doctor Colour Grow which is an impregnating sealer that reaches into the pores of the tile and lifts the natural colours. The owner was extremely happy with the floor and couldn’t wait to have her new kitchen installed to see how it would look.